The couple had married on 6th January 1540, but Henry had never been happy with the marriage and had tried to get out of it before it even happened. Legal proceedings into the annulment had begun on 29th June and Henry was ready to move on to a new wife, Catherine Howard. He married Catherine on 28th July 1540. You can read all about the annulment in my previous articles 9 July 1540 – The End of Henry VIII’s Marriage to Anne of Cleves and Henry VIII Divorces Anne of Cleves. Trivia: Did you know that it was rumoured in 1541 that Anne of Cleves had given birth to a child fathered by Henry VIII? Click here for more information. Anne of Cleves left the marriage with her head intact and maintenance from Henry to keep her in grandeur for the rest of her days. 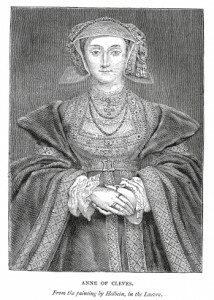 Like Catherine of Aragon, Anne of Cleves had monarchal connections on the continent and Henry had to show at least a minimum of decency with with post-marriage arrangements. Yes, I’ve read the rumour of Anne of Cleves giving birth. I’ve never read any serious historian giving credence to it. If in fact she did, it certainly wasn’t Henry’s. Good one, Patricia! That was my problem with Joss Stone, too. Couldn’t they have at least used a bit of makeup to make her at least SOMEWHAT homely? Yes I thought that, the actress is an attractive girl and Anne of Cleve’s was considered quite plain and had a pock marked face Joss Stone was much to pretty to be cast as her, they should have used Natalie Cassidy instead. Anne of Cleves actually made a pretty good deal with Henry. Let’s face it, he was not a very attractive catch by the time she met him. Extemely over weight with a horrible stinking oozing gouty leg, a short temper and a whole lot of baggage! Wow, she wound up with an income, a castle ( Hever) & a repectable title and position, as well as her head! There was nothing for her back in Germany so she moved on and had a nice long life in England. The annulment was begining of the rest of her life. -No matter what Henry and Anne of Cleves thought of each other’s appearence; it is clear that neither of them wanted to be stuck in this loveless marriage. Anne may have been shocked and upset to be divorced, she maintained that she was Herny’s true wife to the end of her days; but she must also have felt some relief that she was free. Henry showed her every courtesy and she was received well as Queen, but I cannot imagine that she was thrilled to share a bed every night with Henry. He was miserable in the marriage and she must have felt humiliated. Breaking up by consent and her having the common sense to accept the divorce left Anne in a strong position. Anne received several large houses and two palaces including Richmond and a good secure allowance for life. She even got given Hever Castle. After the death of Henry she did have to swap some of these for other properties, but she still lived in relative comfort and honour.